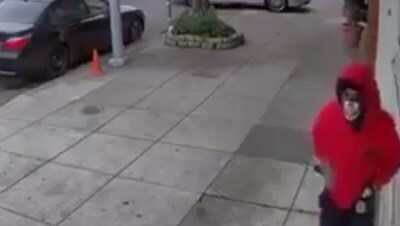 Surveillance video surfaced Thursday that shows a man wearing a mask pulling out a gun on a San Francisco street corner taking aim and firing at a passing vehicle. The incident happened at around 2:30 p.m. on December 5th on Palou Avenue and Lane Street in the Bayview. A man is seen running across Lane Street. He emerges in the upper right-hand corner of the frame. He comes up the Lane Street in the Bayview. with his hands in his pockets. As he gets closer to the camera, it becomes apparent that he is wearing some sort of skeleton mask. As the camera angle of the video changes, three men can be seen walking right in front of him. The man peers around the corner and then takes a gun out of his right pocket. He runs out into the middle of Palou Avenue and fires repeatedly at an approaching black sedan. At another angle, people can be seen scrambling for cover as the man fires at the car just feet away from the gunman. He then runs back Down Lane Street. A police report said officers found shell casings and some property damage in the area. But no sign of the gunman or the car. Officers also said they couldn’t find any witnesses to the shooting.